A lot of people who come to the US on dual intent visas like the H-1B visa, O-1 Visa and L-1 Visa and the non explicit dual intent visas like the TN Visa for Canadians and E-3 Visa for Australians ultimately hope their employer sponsor company for their non-immigrant visa will be happy to sponsor them for a Green Card one day under EB-1, EB-2 or EB-3. Now many never get the chance because their employer companies don’t want the additional expense and time to do this and/or the actual foreign sponsor doesn’t want to endure the long wait times and static career growth as a result of this process. Recently we looked at where Green Card & Visa Sponsored non-immigrant foreigners reside around the US to help people get a better idea of where the opportunities and competition lies. Today we will look at both the companies that are sponsoring the greatest number of Green Card Applications by their Labor Certification data as well as what countries dominate the demographics of these foreign applicants. This data also comes from the US Department of Labor and is for the 2011 Immigration year. Microsoft is by far and away the greatest sponsor of Green Card Applications with 39% of the Top 25 companies total and 6% of all applications. So maybe getting a job in Redmond, WA near Seattle is a great idea! This list is dominated by Technology and Finance companies and the positions that most of these applications tend to be for are Engineers in Computer Science with a few Accounting/Consulting type roles as well. Indian nationals makes up over 50% of all Green Card Applicant sponsors with an average annual salary of above 90K. This is the second highest among the other Top 5 countries being China, South Korea, Canada and Philippines. 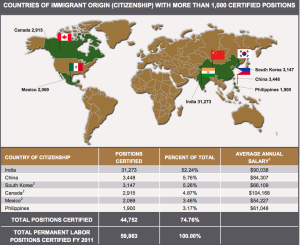 Canadian sponsored permanent residents average salary for the sponsored roles tops 100K which is possibly not surprising given their long standing relationship and proximity to the US and thus their citizens being on the most equal footing with US Citizens of any foreigner when applying for roles and negotiating salary.